KAMPALA – The trial of Entebbe businessman Ivan Katongole, a key suspect in a series of women murders in Entebbe and Wakiso district kicked off on Friday before the High court in Kampala as the husband of the deceased whipped while giving his testimony. The first prosecution witness Anatoli Ndyabagenyi; a husband to the late Nakimuli has told court that he last saw his wife alive on the night of July 22, 2017, before leaving for his second home at Kawafu -Kabaale Parish -Wakiso district. Court has heard that on the morning of July 24, 2017, as Ndyabagenyi was preparing himself to go to work he received a call from his neighbour in Kitala telling him to quickly rush home as his wife was killed. Ndyabagenyi said that he approached his home, he saw a sweater that he knew very well as that belonging to his wife hanging on a cassava plantation from which he managed to identify the deceased. Ndyabagenyi identified Andrew Kizito whom he says owned a bar that he and the deceased used to frequent while Rose Nakimuli was introduced to him by his wife as a cousin sister. 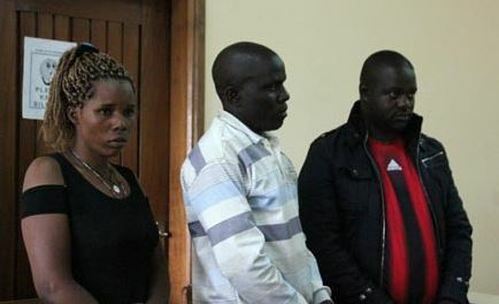 Court heard that after burial, Ndyabagenyi got a call from Nakimuli’s half-sister-Nanteza asking him to do whatever it takes to contact Nabaggala because police had named her as a key suspect in the deceased’s murder something he did thus tricking her into coming to his home at Kitala where police arrested her from. Court also heard that Nabaggala and the deceased had some misunderstandings. The other 2 witnesses are police officers from Mpala and Entebbe police stations who arrested the 3 suspects, visited the crime scene and impounded Katongole’s vehicles which they suspected of carrying the dead bodies. Meanwhile, Court has accepted 2 prosecution exhibits in this case including a post-mortem report from Mulago hospital which indicates Nakimuli to have died due to excessive bleeding and manual strangulation and medical examination reports regarding the sane mental state of the 3 suspects as presented by state prosecutor Baston Baguma. Katongole a dealer in Fish export at Kasenyi landing site is jointly charged with 2 other people; Kizito and Nabaggala for the murder of Rose Nakimuli; a former resident of Kitala LC1 in Katabi Town council on July 24, 2017. Nakimuli’s half-naked body was discovered the following day in a nearby garden with a cassava stem pushed in her private parts. The trial judge Justice Wilison Kwesinga has adjourned the case for further hearing on the January 9.